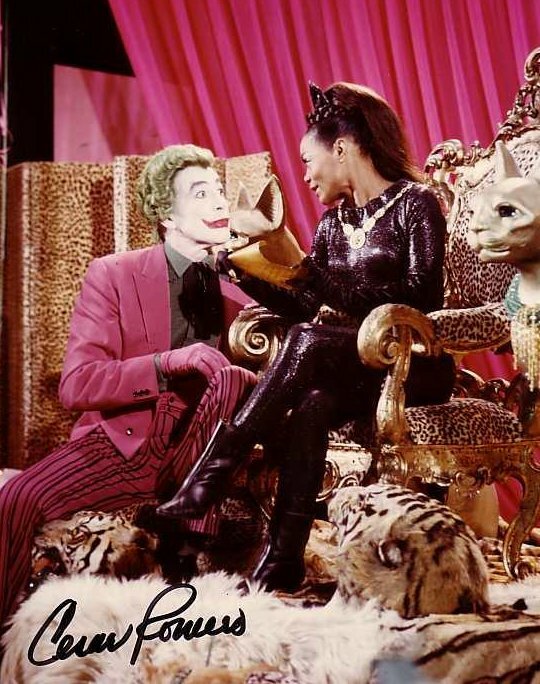 BAT-VILLAINS OF THE WORLD UNITE! 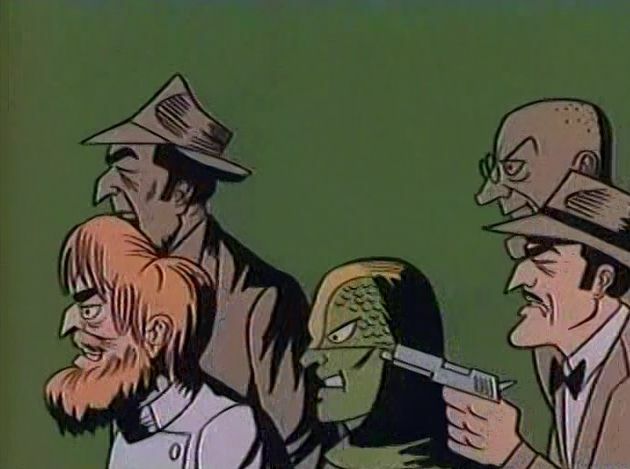 Or: A Fantastic Foray Full of Facts Featuring your Favorite Felonious Fiends Fighting our Famous Friends! 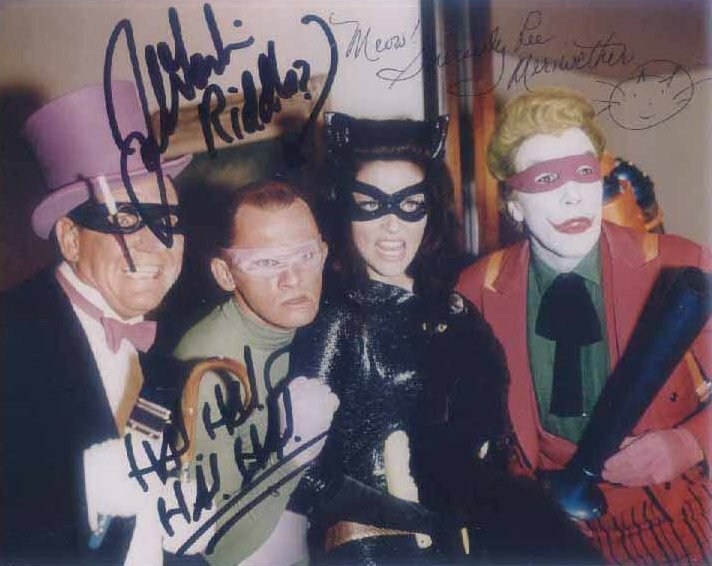 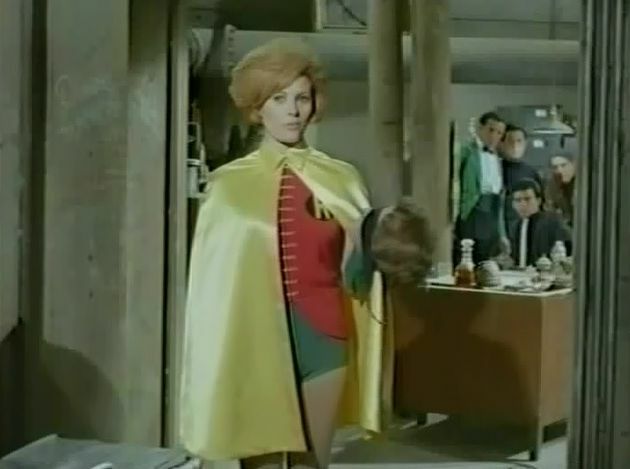 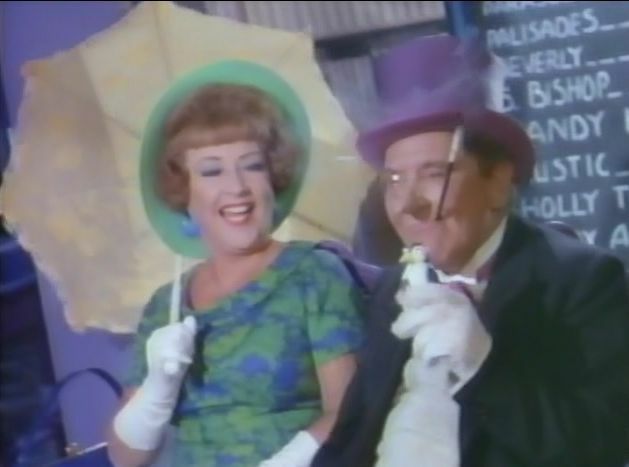 Pictured here are some of the many famous stars of stage screen and television who appeared as villains in the classic Batman TV series, which featured some of the strangest super-villains ever to appear on a weekly television series. 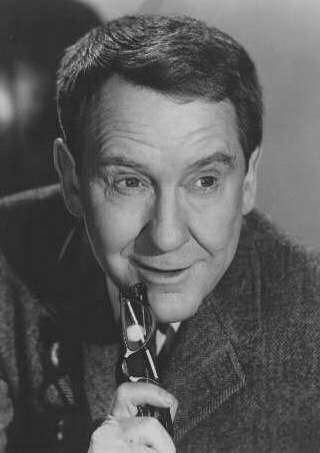 BURGESS MEREDITH (The Penguin) began his motion picture career in 1936, starring in RKO's "Winterset". 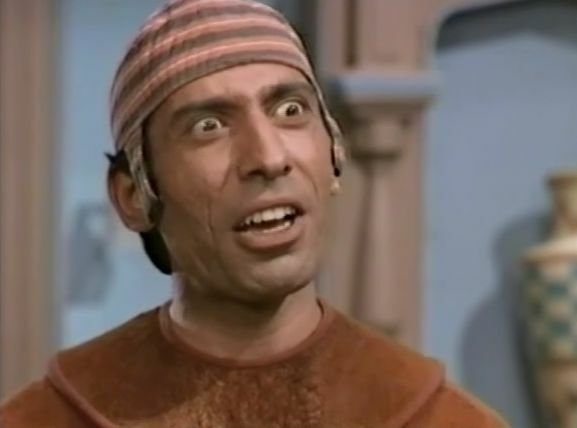 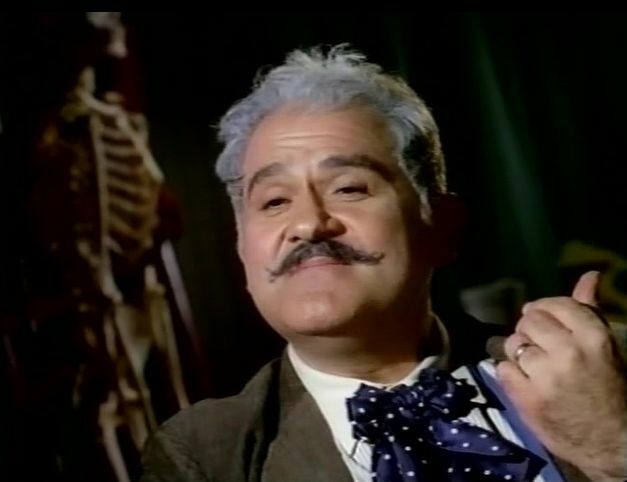 His varied career included memorable roles in televison shows like "Twilight Zone" , "Night Gallery" and "The Adventures of Capt Nemo" and in films like "Rocky" and "Grumpy Old Men" he enjoyed popularity in his later years as well until his death in 1997. 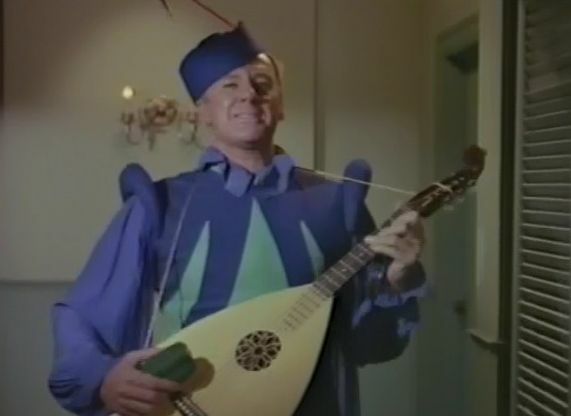 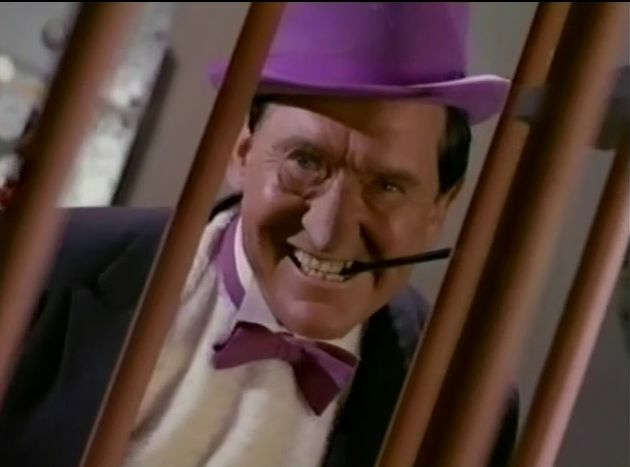 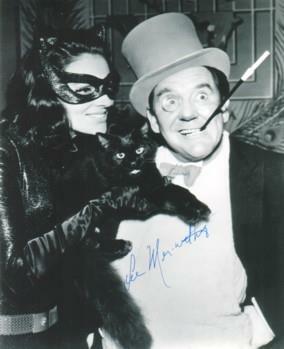 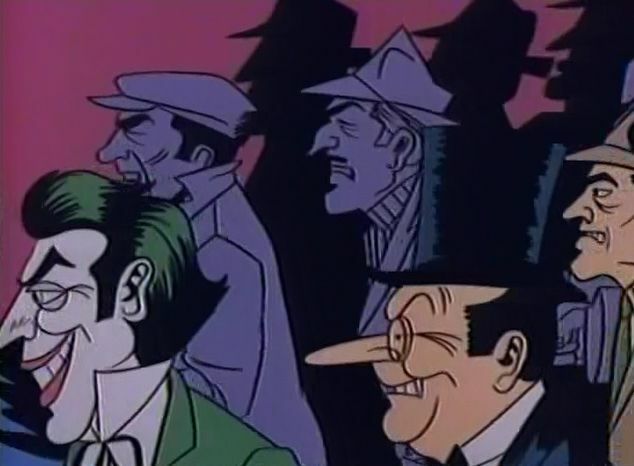 He was personally approached by Batman's Executive Producer William Dozier in 1965 to join the Rogue's Gallery as one of the Caped Crusader's most popular villains. 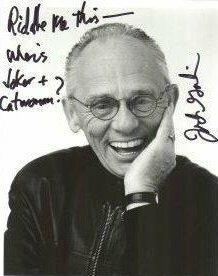 CAESAR ROMERO (The Joker) enjoys the distinction of having appeared on Batman more than any other guest villain-an astounding nineteen times! 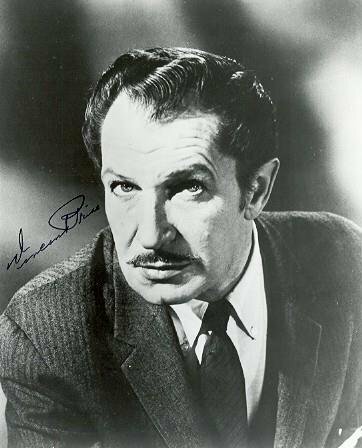 His career began as an actor and dancer on Broadway then quickly progressed to feature films. 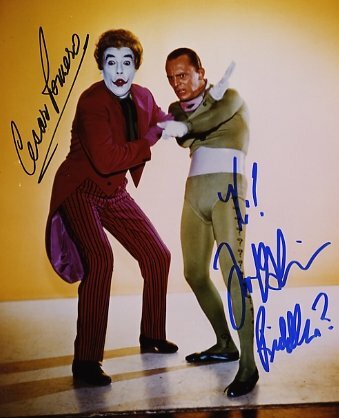 Dozier approached him personally also and asked him to be the Joker on his new TV series, even agreeing to Romero's demand that he NOT have to shave off his trademark mustache for the role! 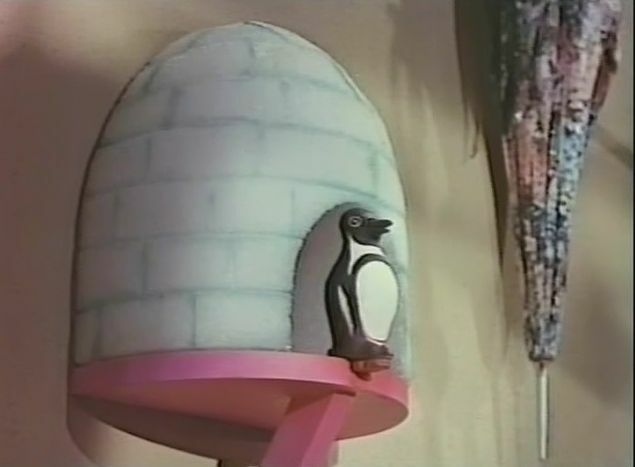 In later years he appeared in Disney films like "The Computer Wore Tennis Shoes" . 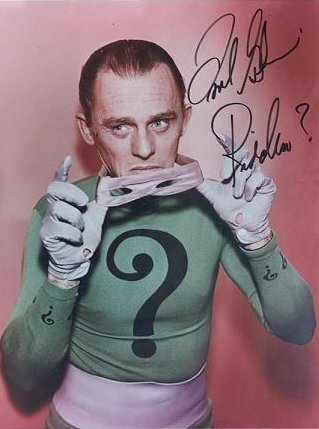 He passed away in January of 1994. 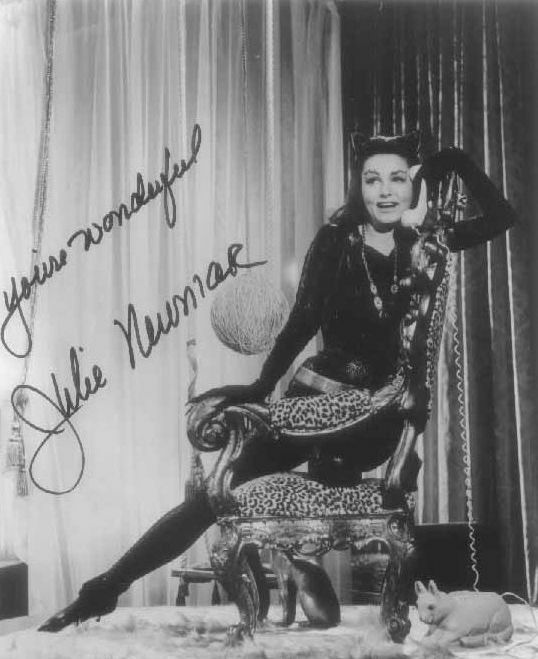 JULIE NEWMAR (The Catwoman) is the daughter of one of the original Ziegfield Follies Girls and Julie herself started as a classically trained dancer and the proof is in those long, lovely legs! 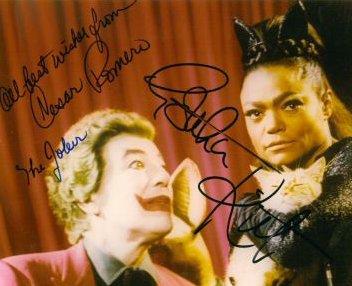 She made her Broadway debut at age twenty-three and later won a Tony Award for her role in "Marriage-Go Round". 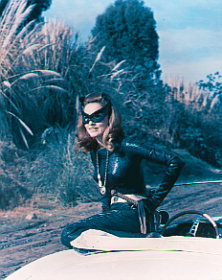 A short-lived televison series followed ("My Living Doll")...then came the Catsuit and a performance for which she will always be remembered. 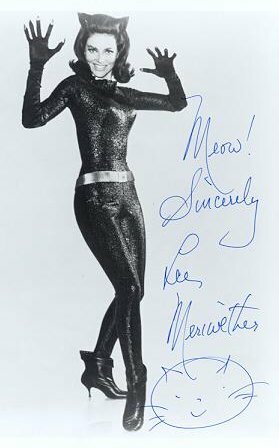 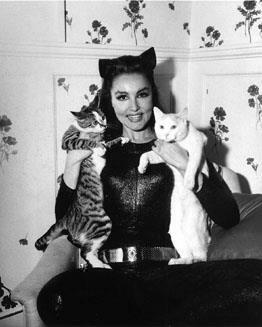 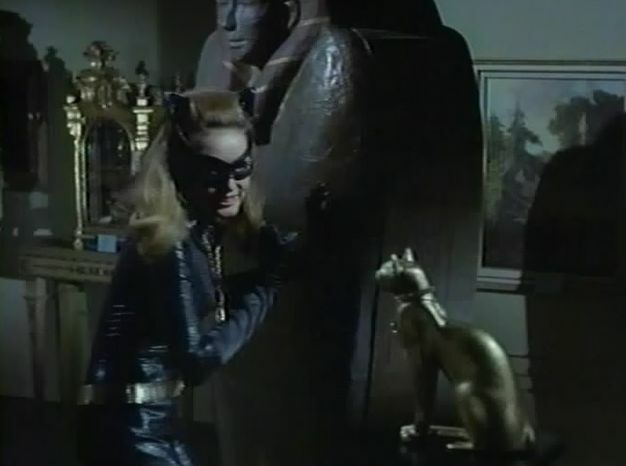 In the Batman movie (1966) and the third season of the televison series she was unable to reprise her role due to other motion picture commitments so the lovely Lee Merriwether took her place in the film and Eartha Kitt replaced her in the third TV season. 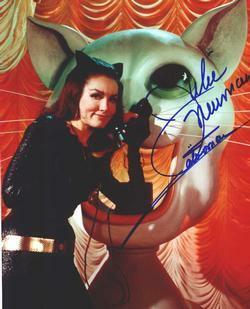 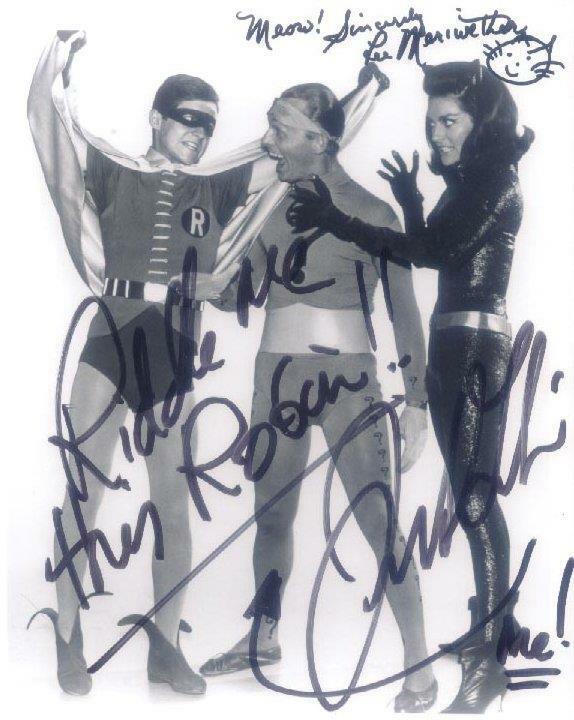 She recently appeared in the Batman reunion movie on televison with original series co-stars Adam West and Burt Ward. 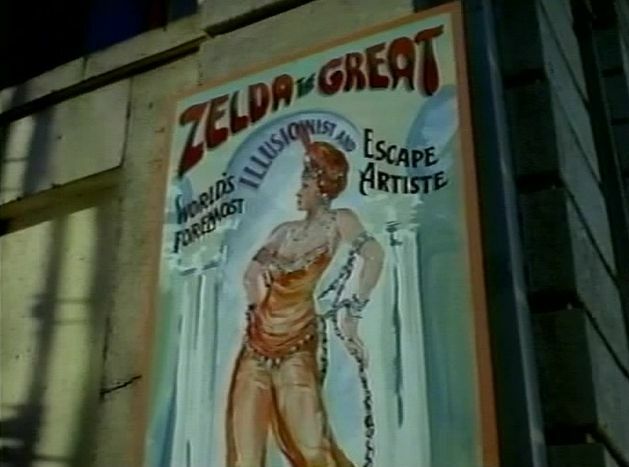 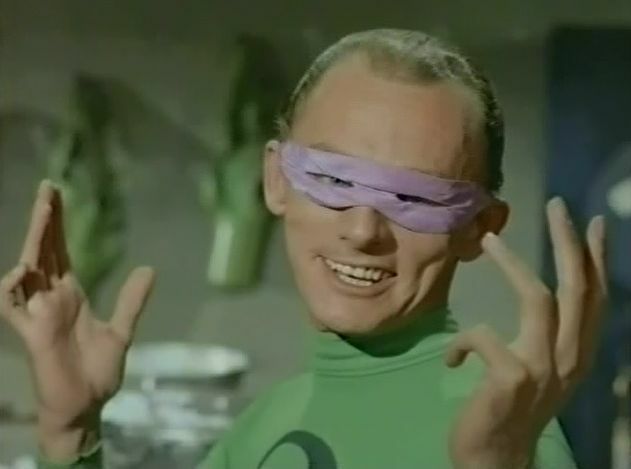 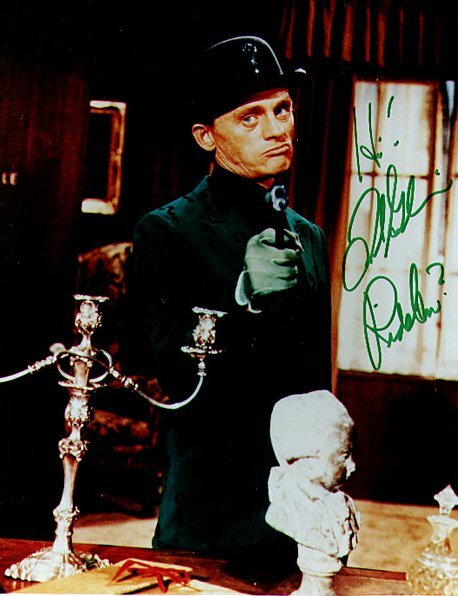 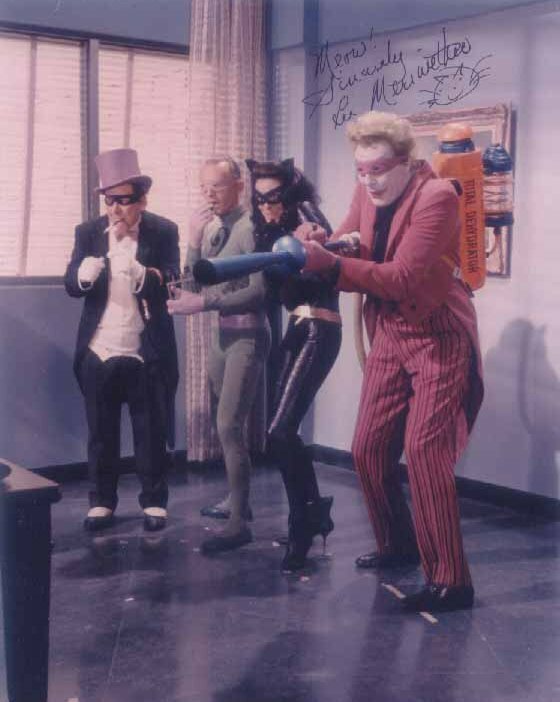 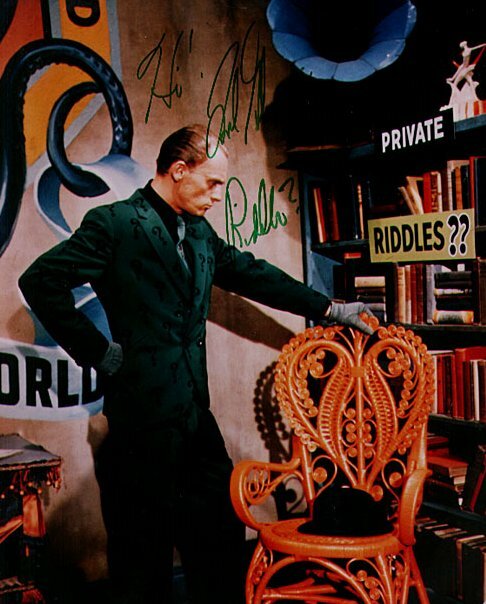 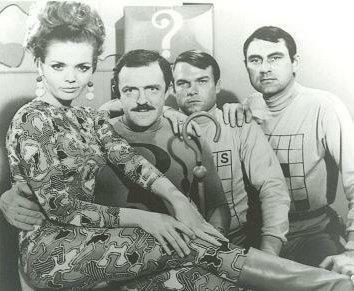 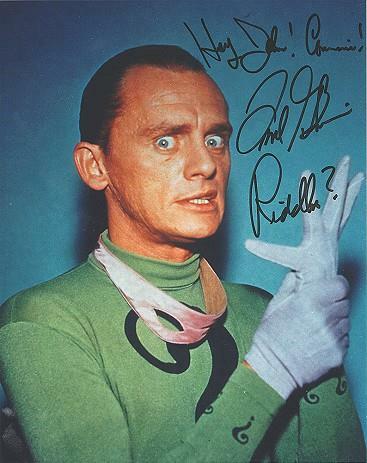 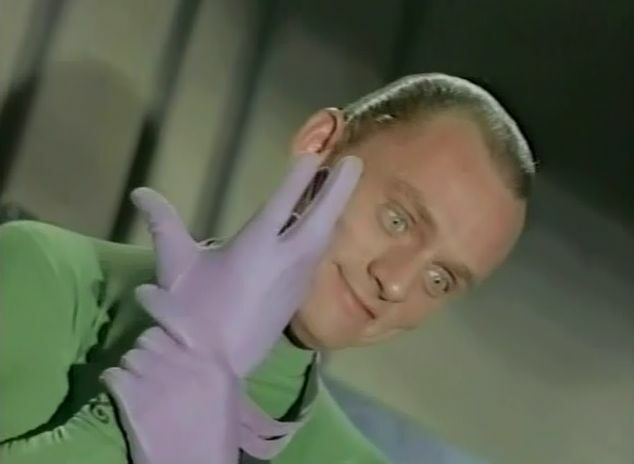 FRANK GORSHIN (The Riddler) is known as the "impressionist's impressionist" for good reason. 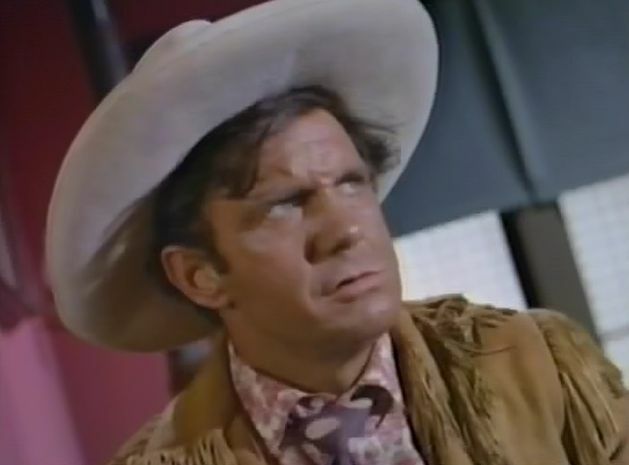 His acting credits include the recent one man Broadway play about George Burns which received rave reviews, classic films like "Invasion of the Saucermen", televison series like Batman and the original "Star Trek" series, recordings and nightclub appearances too numerous to mention. 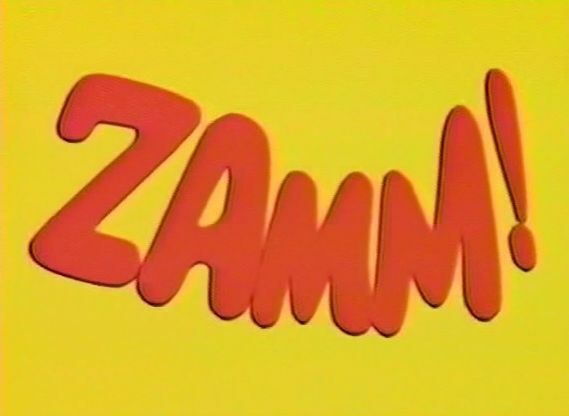 He started as the opening act for comedian Alan King at age 17 and has been working ever since! 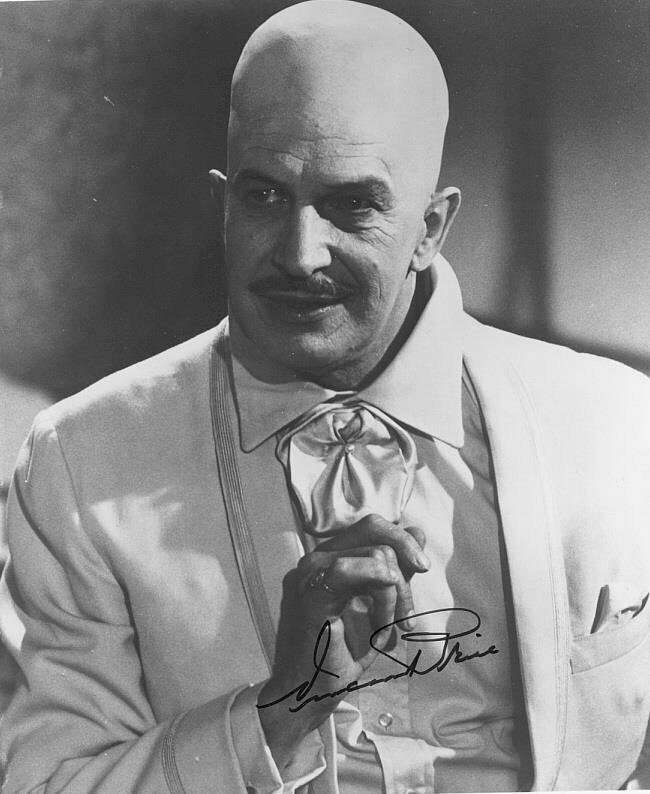 VINCENT PRICE (Egghead) was born in St. Louis Missouri in 1911, made his screen debut in 1938 and after many minor screen roles reached the peak of his popularity in classic horror films such as "The Mad Magician", "House of Wax" and the "Dr. Phibes" film series. 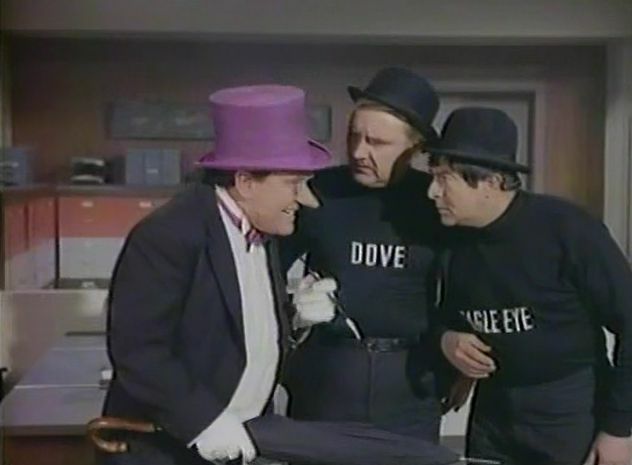 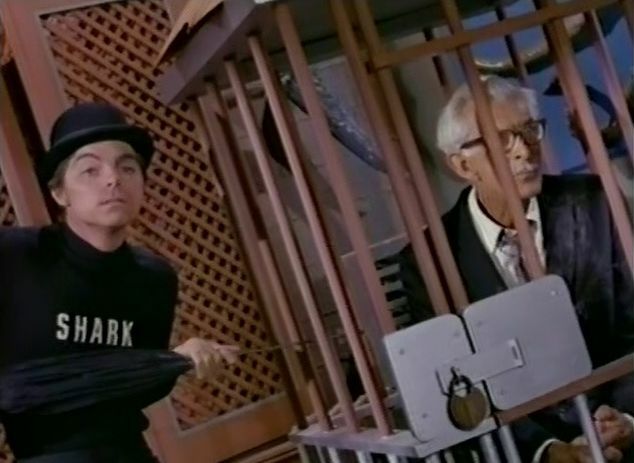 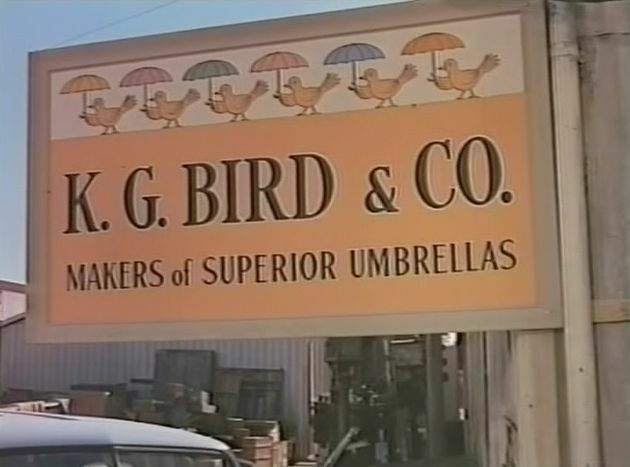 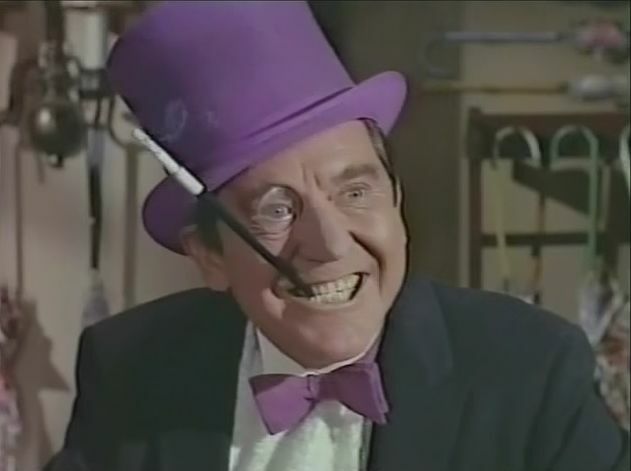 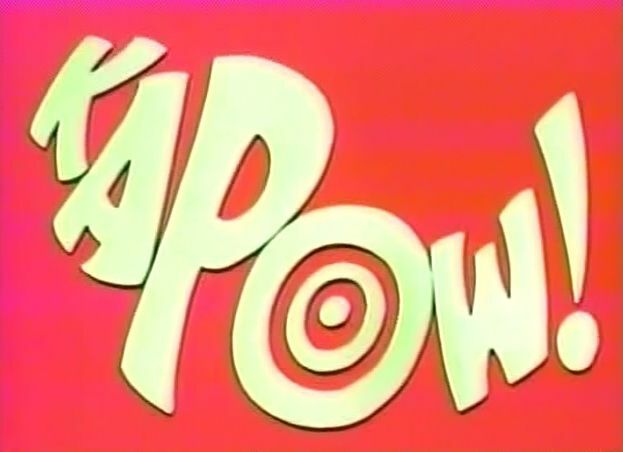 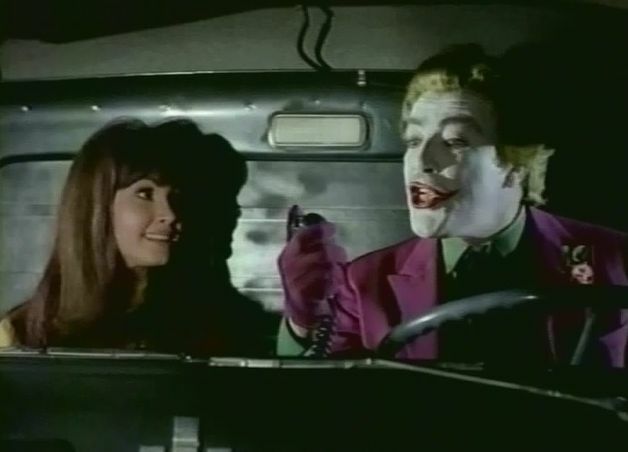 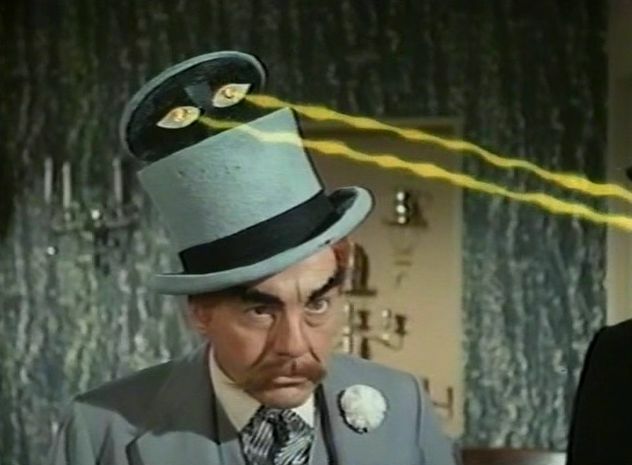 In between motion pictures roles he found time to appear in televison shows like "Night Gallery", "The Brady Bunch", "Voyage to the Bottom of the Sea" and of course Batman, where he is rumored to have initiated the infamous egg-throwing fight with the cast and crew during the filming of an episode! 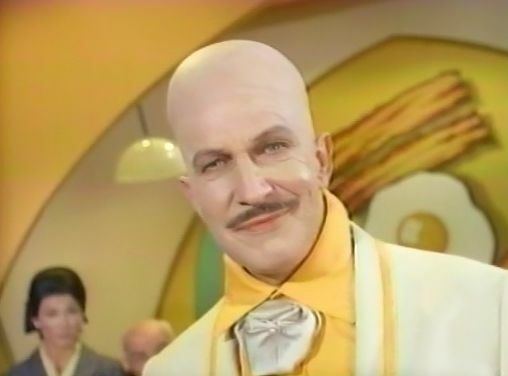 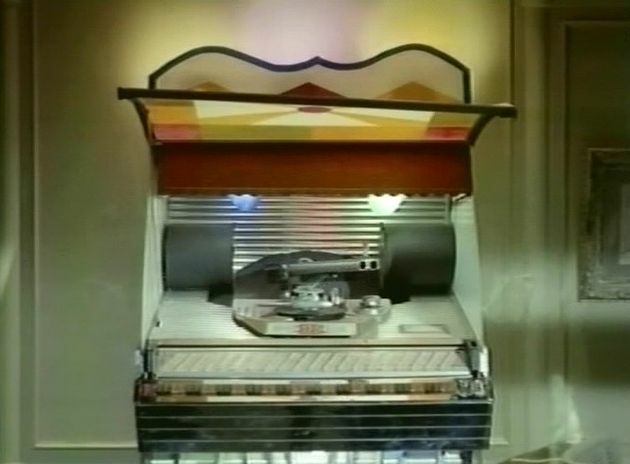 Known almost as well for his many volumes published on fine art and gourmet cooking he also narrated Michael Jackson's "Thriller" album and video. 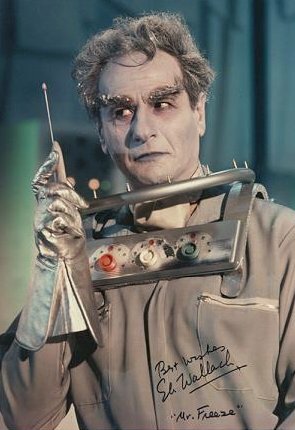 His last movie role was in Tim Burton's masterpiece "Edward Scissorhands". 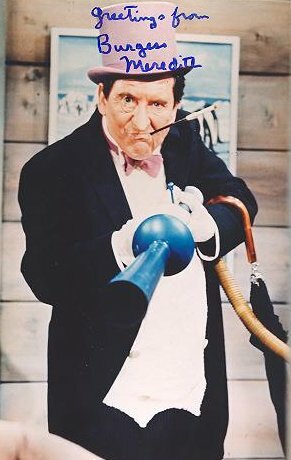 He died in October of 1993. 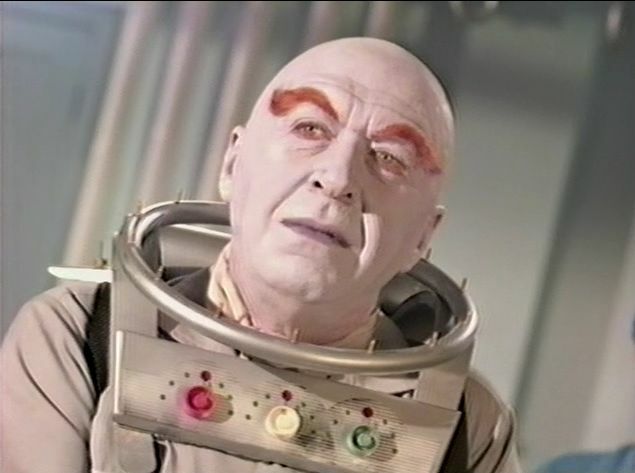 GEORGE SANDERS, OTTO PREMINGER (pictured), and ELI WALLACH (Mr Freeze)....The scientist-turned criminal Mr Freeze was played by these three actors during the series' run. 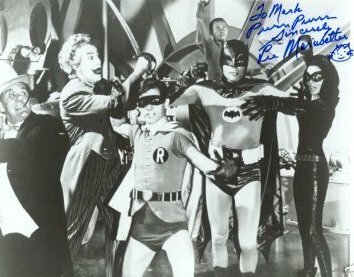 George Sanders, an Oscar winner for 1950's "All About Eve" was first, followed by famed director Otto Preminger, whose credits include "Anatomy of a Murder" and "Exodus" , then by Eli Wallach, star of "The Magnificent Seven" and "The Good the Bad and the Ugly". 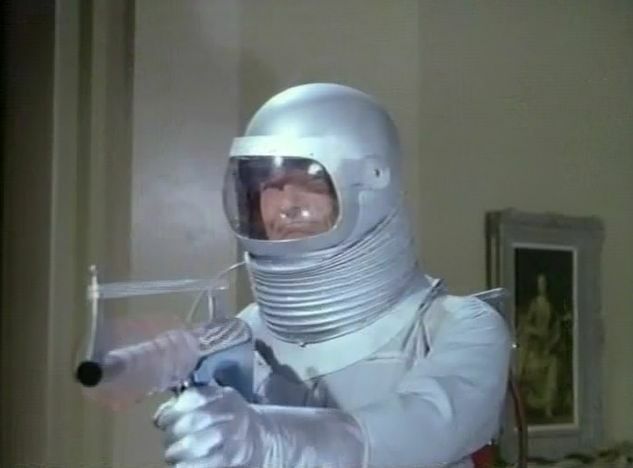 Oddly enough, Mr Freeze did not appear in the third season at all. 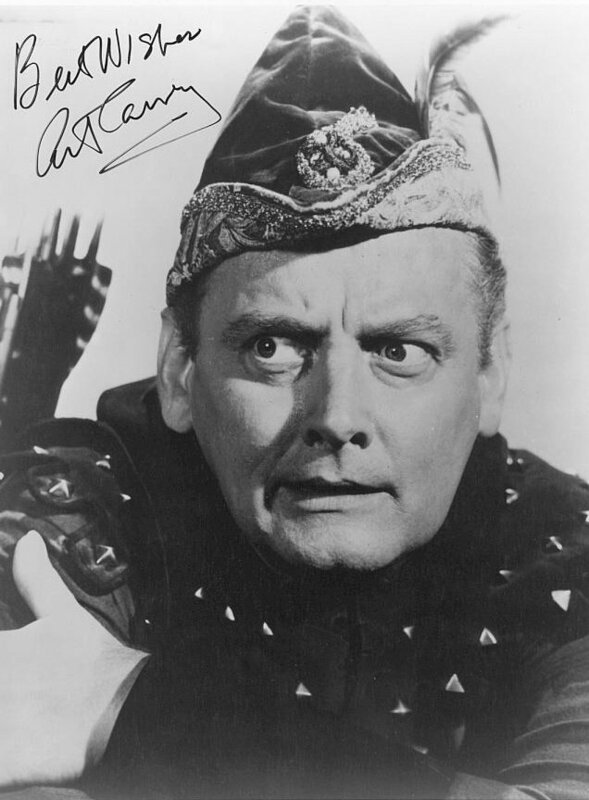 ART CARNEY (The Archer) introduced the second season's crop of new villains in the premiere episodes. 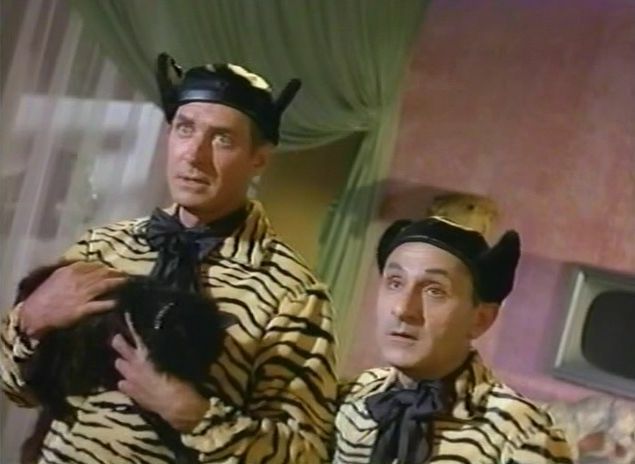 Carney is best known for his role as Ralph (Jackie Gleason) Kramden's pal Ed Norton in "The Honeymooners" for which he won five Emmy Awards, but he was also a Broadway star, originating the role of Felix Unger in "The Odd Couple". 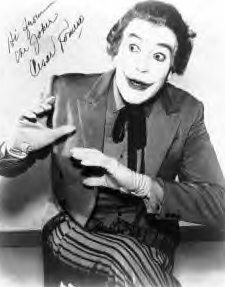 In 1974 he won an Oscar for the film "Harry and Tonto". 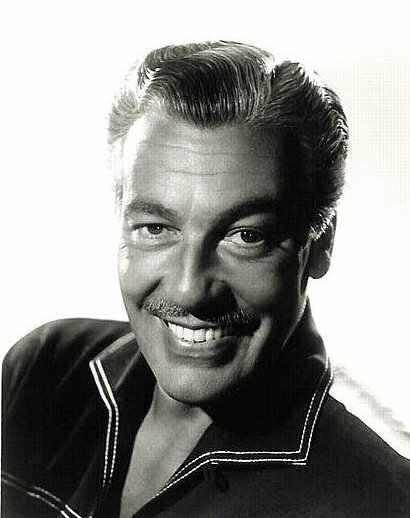 He died in November of 2003. 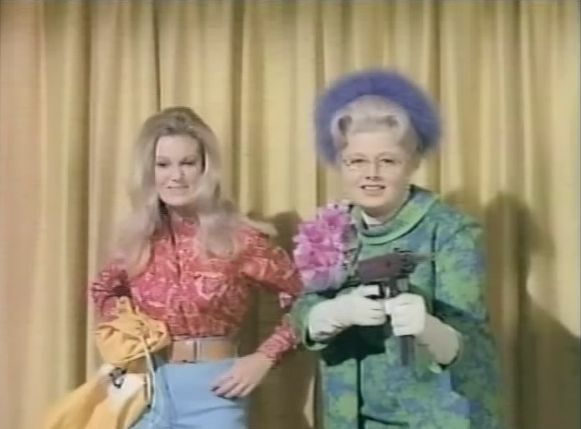 SHELLEY WINTERS (Ma Parker) made her Broadway debut in "Oaklahoma" and won two supporting Oscars for "The Diary of Anne Frank" and "A Patch of Blue". 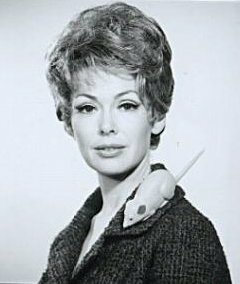 She was nominated for an Oscar for "The Poseidon Adventure" and has appeared in many other films and television shows, most notably as "Roseanne's" grandmother for several years. 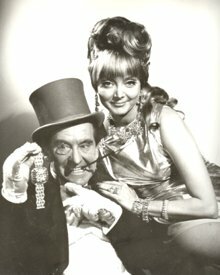 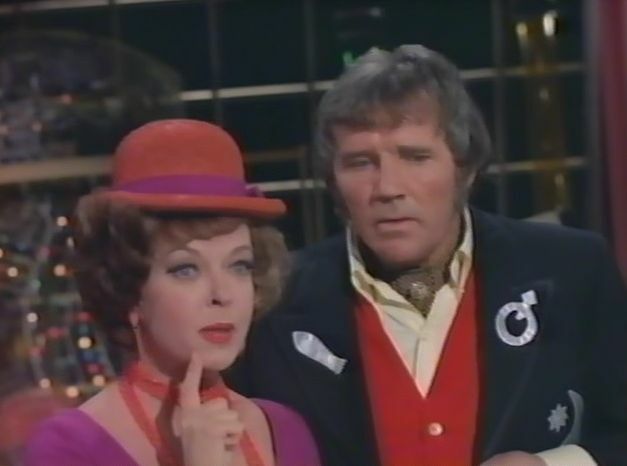 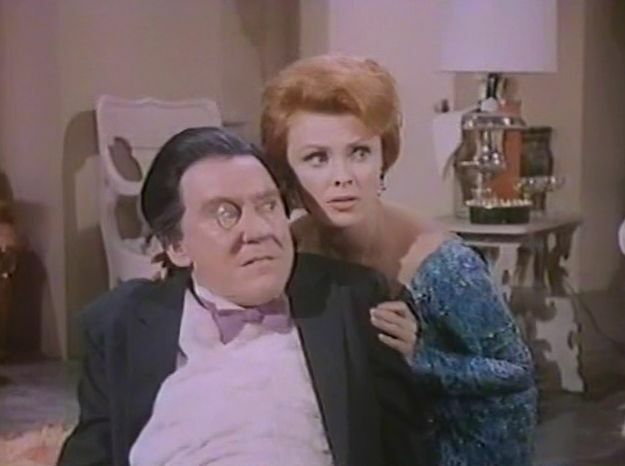 FRANCINE YORK (Lydia) appeared opposite Roddy McDowall (The Bookworm) in several episodes. 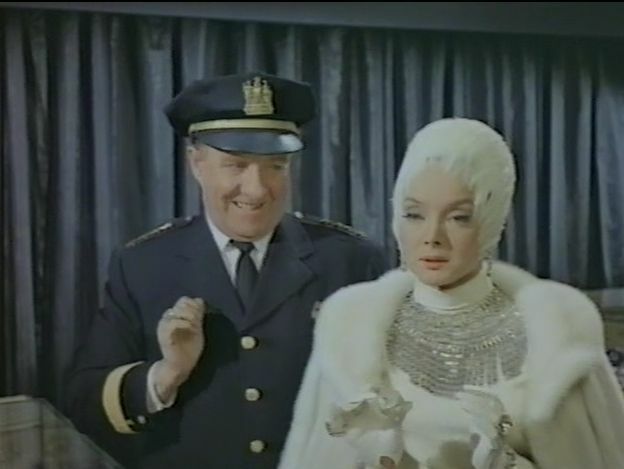 She was a regular in daytime soaps like "Days of Our Lives" and "General Hospital" before choice roles in "Lost in Space" and of course Batman came her way. 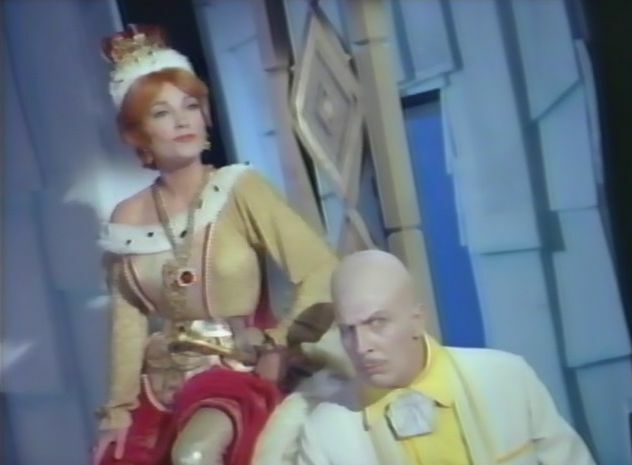 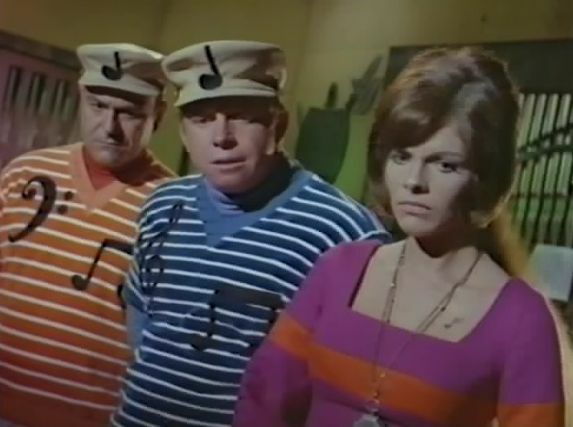 She co-starred in the unaired version of Irwin Allen's "City Beneath the Sea" as well as three of his made for televison movies: "Adventures of the Queen", "The Time Travelers" and "Flood!"